True story. We recently attended a meeting filled with distinguished (old) people, when one guy suddenly points to another sitting across the table: we are batch-mates from such and such elite institution. When lunch was announced shortly and we were able to mingle the opportunity was not missed to raise an inconvenient point: you guys claim you are batch-mates, yet one has pure silver hair while the other has jet-black. What gives? The explanation was thought provoking: in each case it was the daughter who insisted that (a) silver hair looks cool, and (b) hair dye is a must in order to preserve that youthful look from decades back. While greeting a family with a boy-child (as they say) we usually congratulate them by saying that the little angel looks rather calm and peaceful. Most times (99/100) we get a knowing smile and a wink, their harassed faces tell the tale very well. With new dads running around with the girl-child in the park (and the mother safely out of hearing range) we try out a different message (and a different tone): Apurba (we say), you may be able to (barely) escape punishment by not paying enough attention to your wife, but beware, never say no to your daughter (and never forget her birthday). She will remember it decades later (when she chooses your nursing home). Surprisingly enough, not one man disagreed. And now we have proof...even those evil bastards...those big shot financiers are softies...when it comes to their daughters. 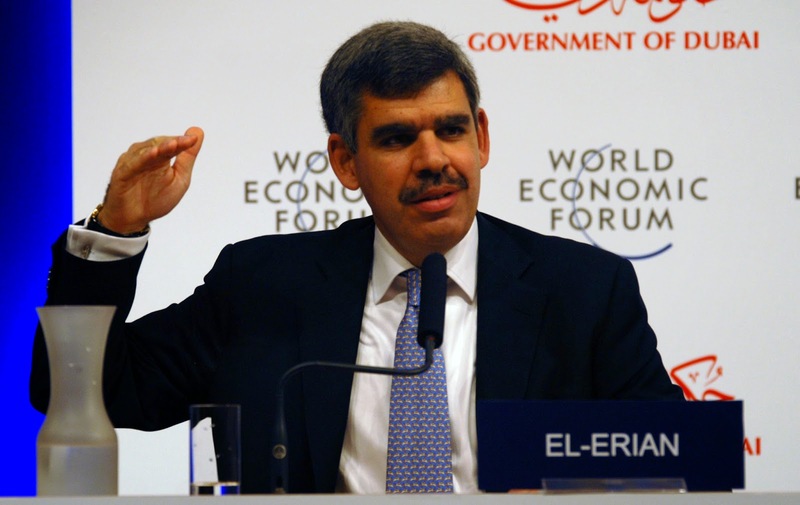 Heartiest congratulations to Mohamed El-Erian...he is undoubtedly the father of the month. What does it profit a man to gain the whole world and forfeit his flesh and blood? May all dads (new and old) learn from this (and not wait till they are in their 50s) and become better men....who make the world a better place to live in. Bravo!!! When the Oxbridge-educated economist stepped down last year as the chief executive of the PIMCO investment fund, one of the largest on the planet, rumour was rife that he had fallen out with its founder Bill Gross. mundane conversation with his then 10-year-old daughter about brushing her teeth which led to her writing him a note listing the 22 important events in her life he had missed due to work. In a moment of domestic truth which will sending a shiver down the spines of working parents the world over, the document presented to the financier included missing the child’s first day at school, her first football match and a Halloween parade. Mr El-Erian, whose earnings at PIMCO reportedly reached as much as $100m a year, said the incident showed him instantly that he had allowed his relationship with his daughter to suffer at the expense of his globetrotting job. In an interview with Worth magazine, he said: “About a year ago, I asked my daughter several times to do something - brush her teeth I think it was - with no success. I reminded her that it was not so long ago that she would have immediately responded. He continued: “I felt awful and got defensive: I had a good excuse for each missed event! Travel, important meetings, an urgent phone call, sudden to-dos. But it dawned on me that I was missing an infinitely more important point. The 56-year-old investment guru, who regularly features in lists of the world’s most powerful or influential financiers, last year swapped his role at PIMCO’s California headquarters for a “portfolio of part-time jobs”, including a role as chief advisor to the fund’s German parent, Allianz. Mr El-Erian said he realised the trope of departing executives and politicians that they wanted to spend more time with their families was a cliche but added he had realised his time was better spent being a good father than a good investor. In a separate interview with Reuters, he declined to comment on his relationship with 70-year-old Mr Gross, saying only that the so-called “Bond King” was “brilliant”. In the meantime, Mr El-Erian said he was enjoying his time with his daughter, preparing her breakfast, driving her to and from school as well as planning a holiday together. Aur tumhare paas kya hai? "Indian Muslims live for India....die for India"
"My dad is from Jullundur"
"Price of every tear will be paid"
Pakistan: Weimar Republic of Asia? "Then be ready for the fire"
"The Prophet would be anonymous"
"They have stormed the PTV office"